Former Florida State University football coach Bobby Bowden strikes me as one of those Southern racists who are so racist, they don't truthfully believe that they're racist. The kind of racists who will pat a black man on the head or call his closest black male friend "boy"—you know, a Paula Deen-style racist. During media rounds for his documentary The Bowden Dynasty on Wednesday, Bowden was at ESPN's Mike & Mike when he let all his Southern-fried bigotry slip out. "During my last days at Florida State, 65 to 70 percent of my boys did not have a daddy at home," Bowden said, Sporting News reports. Clearly, a look at the sideline of any of Bowden's FSU teams in his later years shows that more than 70 percent of his team was made up of young black men. "They're raised by mommas. Thank God for them mommas, or grandmommas. Or big sister, or aunt. But where's the man? A boy needs a male figure, and the girls do, too. Somebody to discipline them and make them be a man. I used to kid about this—they grew up wanting to be like their momma. They want to be a man like their momma; that's why they wear earrings." Bowden, 87, claims, of course, that this was a joke, and that he didn't mean anything by it. 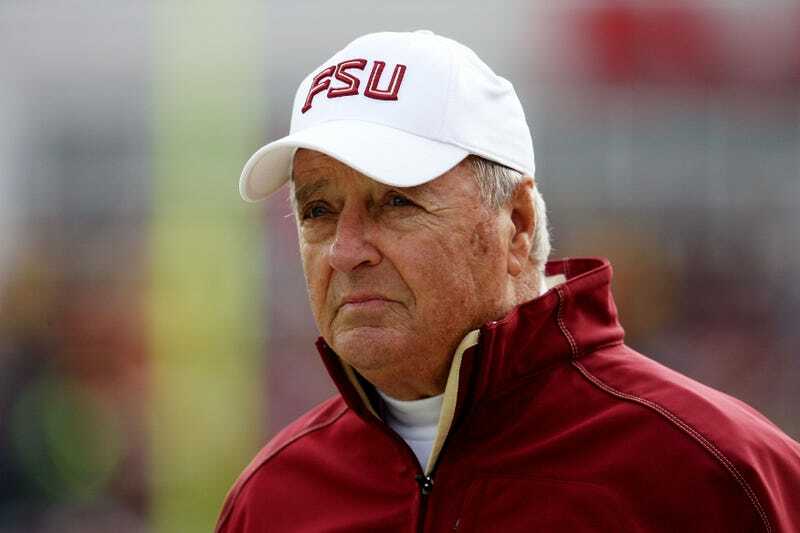 "They never finish what you say," Bowden told the Tallahassee Democrat. "I was kidding about that. And I made a statement, 'Thank goodness for these sweet mothers.' And I said I was just kidding, but they leave all that part out." Uh, yeah, got it; a joke. But that wasn't the only weird comment Bowden made while on the show. He also talked about how he slept in a potential recruit’s bed the night before the teen could sign his letter of intent. "Slept in a boy's bed the night before signing day while other coaches were out in the front yard waiting for 7 o'clock," Bowden said. "Slept in his bed that night, got up and ate breakfast. His momma cooked me breakfast. I knew I had him. "That was back when you could do that,” he added. “You can't do that anymore." Read more at Sporting News and the Tallahassee Democrat.